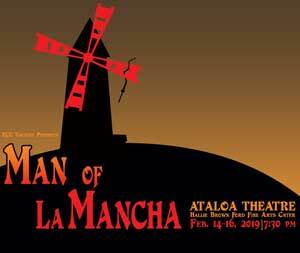 ECU Theatre brings you the classic musical "Man of La Mancha" directed by Alan Marshall and featuring Dr. Richard Groetzinger as Don Quixote. The original Broadway production starred Richard Kiley and more recent revivals have starred Placido Domingo, Raul Julia, and Brian Stokes Mitchell in the lead role. It was also made into a movie with Peter O'Toole and Sophia Loren. The musical features songs like "the Impossible Dream," "I Really Like Him," "Dulcinea," "It's All the Same," "Aldonza," and "The Golden Helmet of Mambrino."